About the size of crows, pileated woodpeckers are some of the most dramatic-looking birds on the continent. At first glance, male and female pileated woodpeckers look identical with their lightning-bolt white stripes slicing across their heads and necks, and black bodies topped off by a brilliant red crown of feathers, but subtle differences will let you know the gender of the bird you're observing. A close look will reveal a red stripe on the male's cheek extending from the base of the bill to the neck. This same stripe will be gray on females of the species. The female has gray on her forehead just beneath her red cap, as well as a dark gray eye stripe. Males have red foreheads and dark black stripes through the eyes. 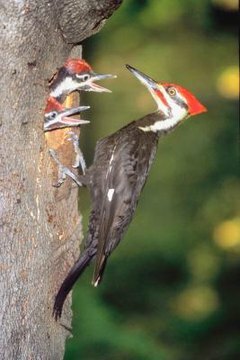 While male and female pileated woodpeckers can be heard as they tap into trees looking for ants and other edible insects, the males alone will excavate nest holes for breeding. The female will help put the finishing touches on the nest and arrange leftover wood chips as she prepares to lay her eggs near the completion of the three- to six-week project.